As much it pains you to know and see that a loved one has passed, it is important to celebrate the life he or she has lived. Giving him or her a proper funeral service will allow the people who have loved him/her to gather and pray for his or her eternal rest. With that, it is essential to have an organized funeral service; a funeral order of service is a schedule for the ceremony. Like a funeral program, it provides a sequence of activities for the event. Losing a father will never be easy; you lose someone who has been with you to guide you during good and bad days. But to honor the legacy and selflessness he has shown all throughout his life, a peaceful funeral service should be held to celebrate his life. 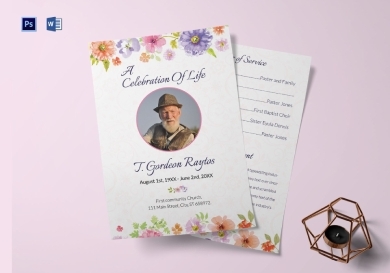 To make sure that people know the order of activities to be done for the service, you can use this funeral order of service template; download this template and just edit it accordingly. Making sure that the service you hold for a departed loved is organized is a priority, that way you can ensure that there is a solemn celebration for the life he or she has lived. 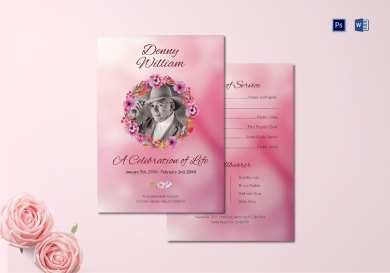 Using a funeral order of service as the funeral stationery you give during the ceremony will allow you to put all the activities of the service in an organized manner will ensure that the attendees are informed about the flow of the ceremony. Although a funeral order of service contains serious order business, it doesn’t mean that it shouldn’t be beautiful. The design and illustrations you incorporate on the card should embody the personality of the departed. 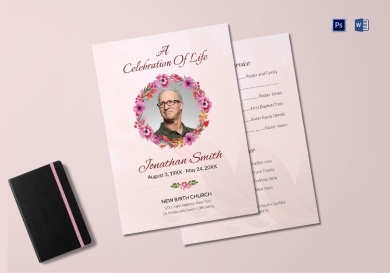 For example, for a loved one who was always fond of colorful and beautiful flowers, you can have the order of service card have a floral design. That way his or her love for his/her favorites is still incorporated until his/her last days. Funeral order of service is basically a program that organizes the activities for the funeral service. It helps people know the sequence of the activities that will be conducted during the event. Although both are different documents, it can be made into one. 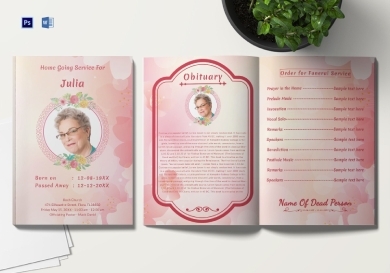 This funeral order of service program will allow you to include significant details about the funeral service in an organized sequence. You can download this template to use as a guide for the funeral service. As much as you want every significant people on the deceased’s life to attend his or her funeral, it is just not possible. But you can inform them ahead of time about the ceremony and the activities that it entails. You can use a funeral order of service as a funeral invitation to invite guests to honor the life of the departed. It should contain information about the ceremony such as the date, time, venue, and so on. Although not everyone the deceased knows has the same religion or maybe some don’t even believe in any religion, it is still good to ask them to pray for his or her eternal repose. A funeral prayer order of service presents the details regarding the ceremony and what the attendees will be doing on a specific time schedule. If you are looking for a well-designed funeral prayer order of service, you can download this template from this article. 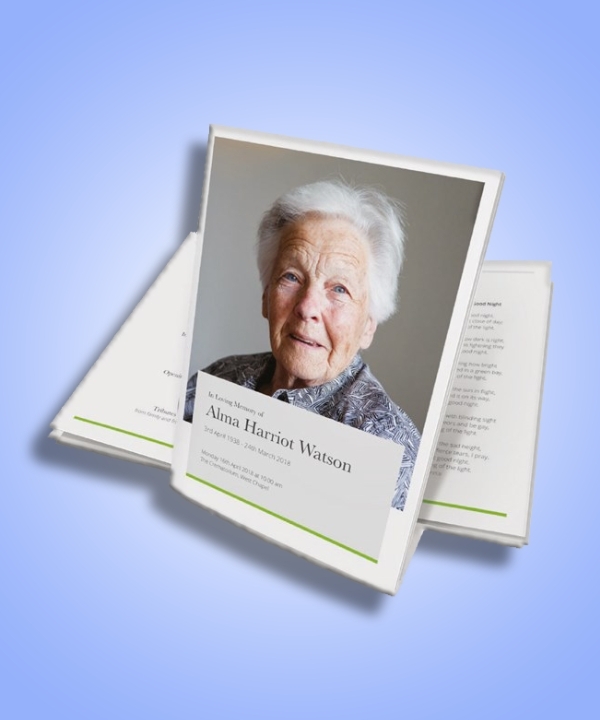 The funeral order of service you make for the funeral service of a loved one can be on a brochure format. That means you can have a bifold or trifold brochure that will allow you to incorporate more necessary of preferred details regarding the ceremony. 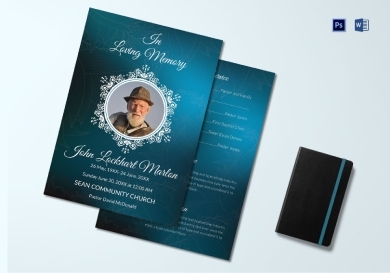 You can also use the space in a funeral order of service brochure to include more of his or her photos or include his or her favorite prose, poem, etc. along with more of his or her images. As much as it pains and saddens you that a loved one has passed away, it is important to pay tribute and say thanks for the life he or she was able to live. Together with the significant people on his or her life, you can hold a service of thanksgiving to commemorate the life of the deceased. The order of service card you create can be as simple as this example, just remember to provide all the essential details about the event. If you are planning to have a religious funeral service for your departed loved one, you should aim to have a solemn program. Take a look at this cathedral funeral order of service example, it has a simple and direct layout. It only has minimal designs present such as the borders and official crest of the office or organization the deceased is related to. 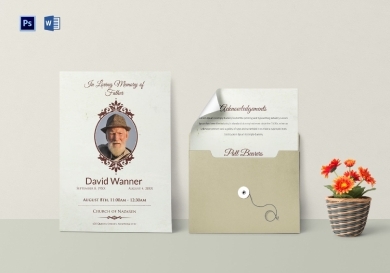 This is the perfect guide to use when you want a basic funeral order of service. 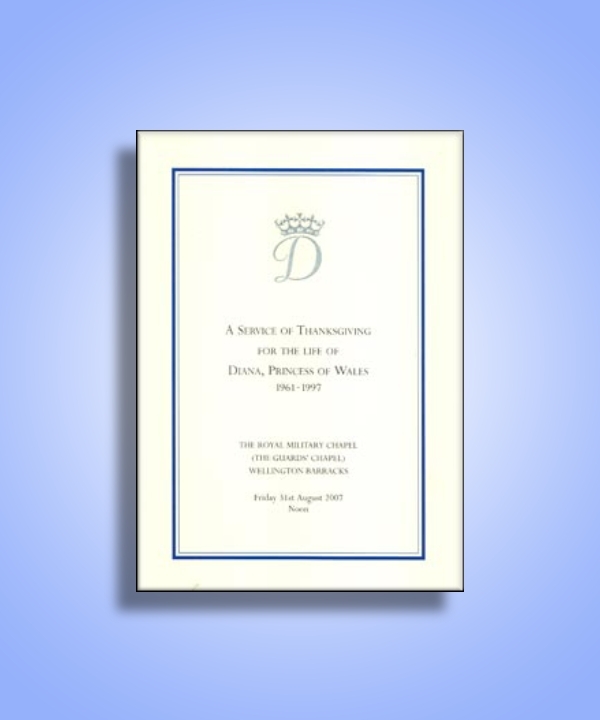 A princess is worthy of an elegant funeral order of service just like with this example. Although it has a minimalistic design, it exudes elegance with its design elements. The logo used to represent the late Princess Diana simply embodies class along with the dainty double border. 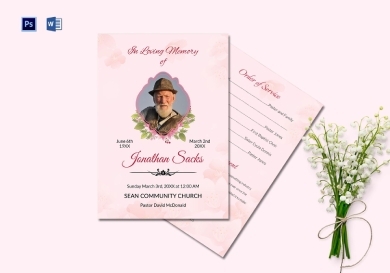 If you are planning to create a simple yet classy funeral order of service for the funeral service of a loved one, you can use this example as your guide. 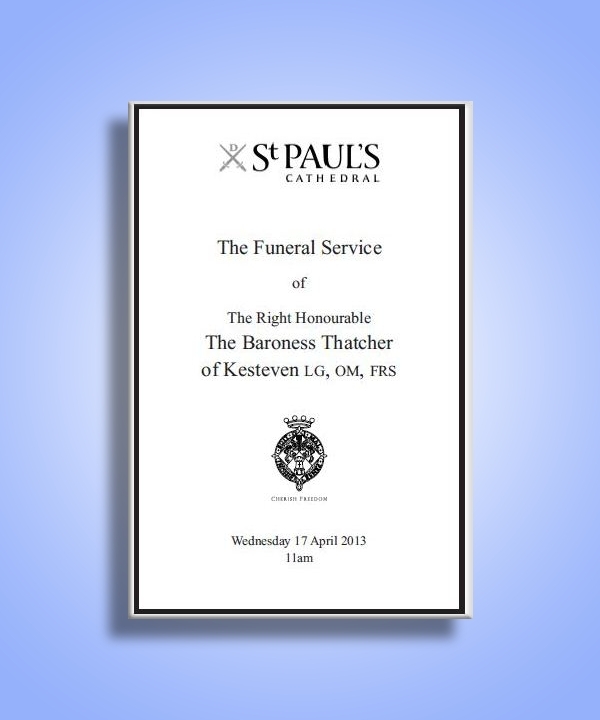 Contrary to the previous example, this funeral order of service emphasizes the image of the departed on its front page. It allows the people to see his or her last image while he/she was still alive. 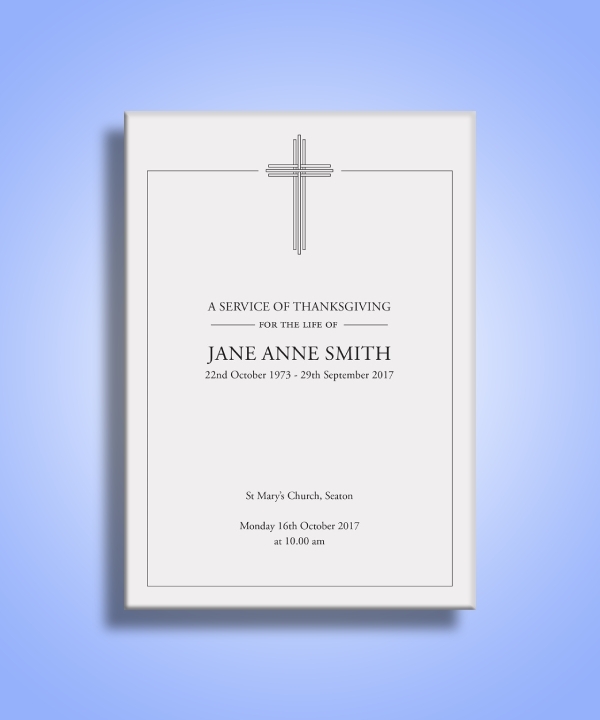 If you want to do this with the funeral order of service you create, you need to provide fewer details about the ceremony on the front; the other essential details can be provided on the back of the card.